I was given Mark Bittman’s new How to Cook Everything Fast cookbook for Christmas. I enjoy reading Bittman and always learn from him. This new book has some good tips for multi-tasking to streamline prep times which should just be common sense. Sometimes you have to be told so you can get it! Little things, such as get your chopped onion sweating and then work on dicing the carrots and celery for a mirepoix, do speed things up. He also suggests deconstructing a recipe to simplify preparation and still come up with the same great flavors. One of his recipes is for a tomato, bread and white bean soup that reminded me a a fresh tomato and bread mush I learned to make last summer. I decided it would be a good cold weather supper so I went to work. A little way into the prep, I decided to deconstruct the recipe. Rather than make a soup served over toasted croutons, I reduced the soup to a thick sauce much like a very chunky marinara and served it over toasted slabs of chewy country-style bread. I served it with a small pan-grilled pork cutlet. I still have enough left over so I can add some chicken broth and return it to a soup consistency for lunch over the next couple of days. I’ll also stir in some left over kale to reinvent the dish. 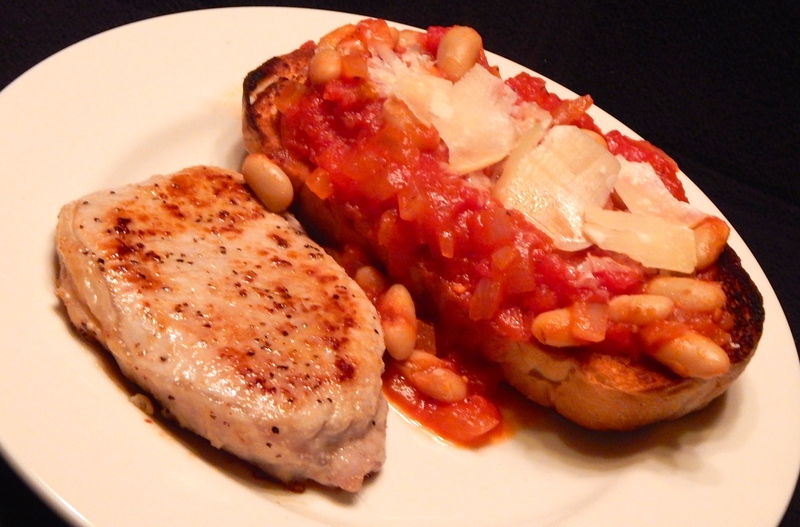 Deconstructed tomato, white bean and bread soup. The soup was reduced to a saucy consistency and served over toasted bread. An accent of shaved parmesan made it special. The soup is very simple – a diced onion, sweated tender with a tablespoon or two of olive join, a diced carrot, a 28 oz can of whole, peeled tomatoes, a teaspoon of dried thyme, three or so cans of reduced sodium chicken broth and a can of rinsed canellini beans make a great hearty soup. Break up the tomatoes as you heat them. You can use a spoon in the pot or do what I did. I fished wipe the tomatoes out of the can and squeezed them through my fingers into the pot. Is that rustic or what? You can reduce the amount of broth and cook the soup down to a saucy consistency. I served it of great over a thick slap of country-style bread toasted under the broiler. If you make it wet and soupy, you can cut the toast into chunky croutons and put them in the bottoms of soup bowls before adding the soup. I added parmesan shavings. If we hadn’t had a hard freeze, I’d have sprinkled some chopped basil on top. Cooler nights inspire comfort foods. 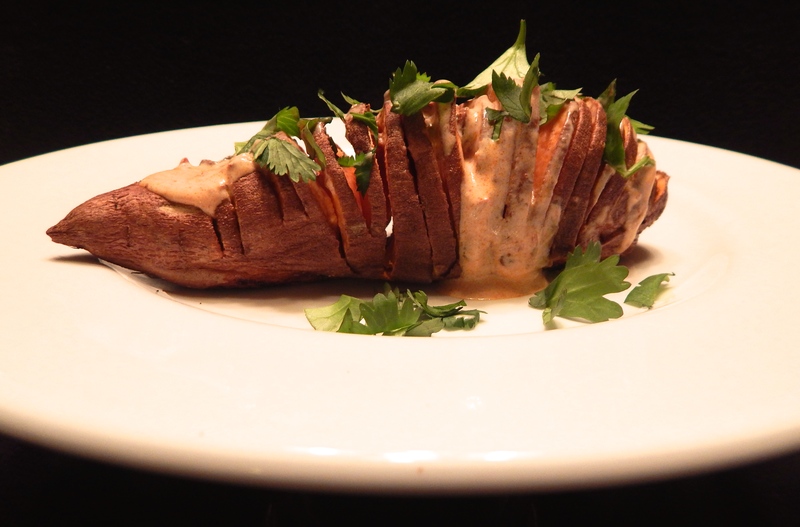 I tried a new variation on a favorite – baked sweet potatoes with chipotle cream. I usually peel and slice sweet potatoes and bake them in a casserole with a mixture of minced chipotle chiles in adobo and Mexican cream. Delicious, but sometimes the crema breaks and the casserole looks like it was sprinkled with cottage cheese. Tasty, but not attractive. Time to think outside the casserole dish! 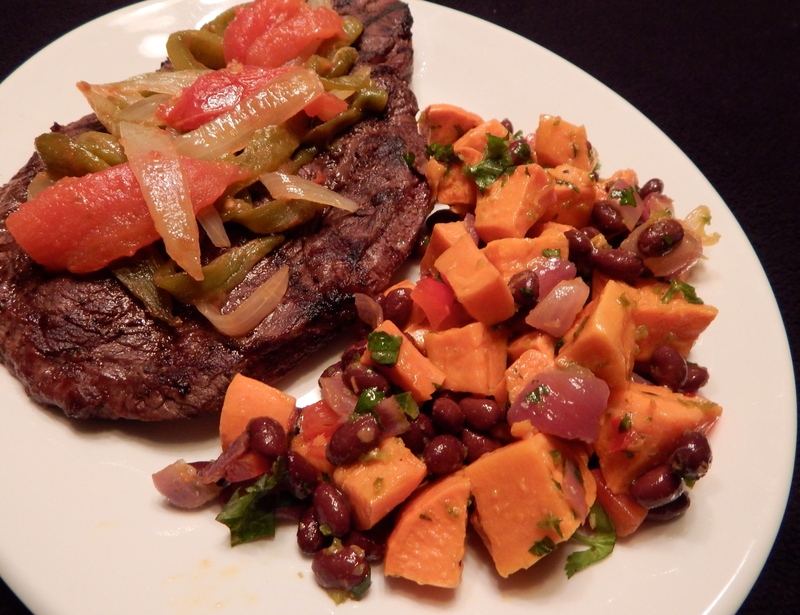 Would the hassleback potato technique work with sweet potatoes? Hassleback sweet potato with chipotle crema and cilantro. It worked! To make hassleback potatoes (white or sweet), I place the potato between two pencils on my cutting board and slice the potatoes at 1/8 inch intervals. The pencils keep me from cutting through the potatoes. After slicing, I brush them lightly with butter or oil and get a little inside the slice cuts. Bake them at 375 until done. I poke them with a tooth pick toward the middle to test for doneness. I topped my hassleback sweet potatoes with that mixture of minced chipotle pepper in adobo, a little extra adobo sauce and Mexican crema. You can add as much chipotle to the crema as your tastebuds allow. And, lest you think we only had sweet potatoes for dinner at the double wide, here’s the rest of the meal – braised boneless beef ribs topped with barbed sauce and steamed kale with garlic chips (paper thin slices of garlic steamed with the kale). A few drops of Frank’s Red Hot Sauce kept the spicy them going all around the plate. The whole Dinner at the Doublewide. 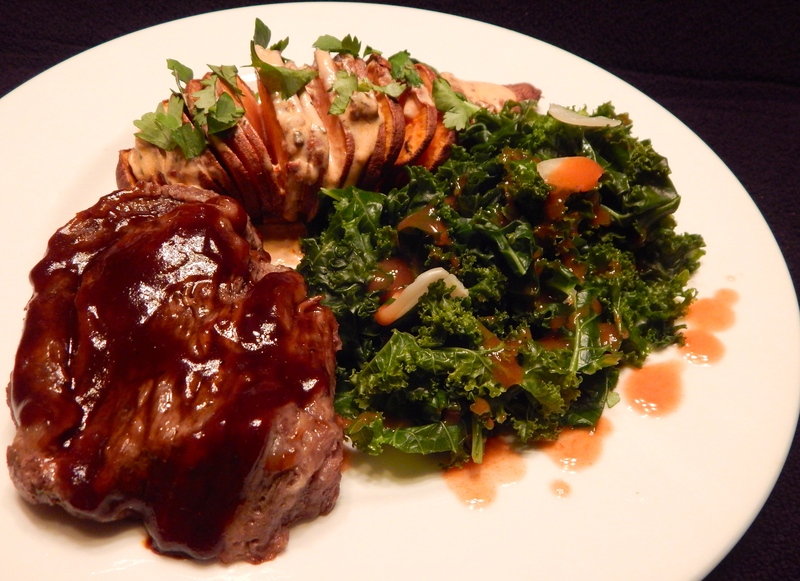 Braise boneless beef short ribs, hassleback sweet potato with chipotle crema and steamed kale with garlic chips and a sprinkle of hot sauce. Browsing through the ever-growing stacks of cooking magazines, I saw an interesting sandwich with arugula, provolone and a poached egg. I enjoy poaching eggs almost as I enjoy eating them. I needed eggs, so while at the store I picked up a box of baby arugula and a small packet of provolone. Back at home, the search began… where was that picture and recipe? What bread did they use? What spread, if any, was on the sandwich? Days later, I still haven’t found it, but I’m confident it will turn up again. In the meanwhile I decided to see what I could do with the ingredients I remembered. When I poach eggs, a put two tablespoons white distilled vinegar in a custard cup for each egg. I break the eggs into the vinegar and let them sit a few minutes while I heat water and a little more vinegar in a deep pot. As the water heated, I toasted whole grain bread and slathered it side to side with my favorite Trader Joe’s whole grain dijon mustard. In a skillet, I warmed John Morrel “Off the Bone” sliced ham. It is real sliced ham, not pressed food glue ham; it is too thick to read through like most deli-shaved ham you can find. It is worth searching for. I just warmed the ham through, I didn’t want to fry it. I topped it with a couple of slices of provolone and turned off the heat so the cheese would warm and soften but not get runny melted. When the water was simmering, I began to swirl it gently until I created a vortex in the center of the pan. I carefully slipped the egg into the vortex and kept it swirling. The egg began to gather and poaching strings of egg white were minimized by the swirling and the vinegar’s action. The egg shaped up beautifully and after no more than three minutes in the water, I lifted it out with a slotted spoon and placed it on a paper towel to collect any remaining vinegar water. I’ve never had one of my poached eggs stick to the paper towel and I use extreme caution when moving it to the serving plate. I placed the warm ham and cheese on the mustard slathered toast, put a scant handful of arugula on top and nestled the egg into the greens. A little poke with the tip of a knife and a trickle of yolk added more color to the open faced breakfast sandwich. 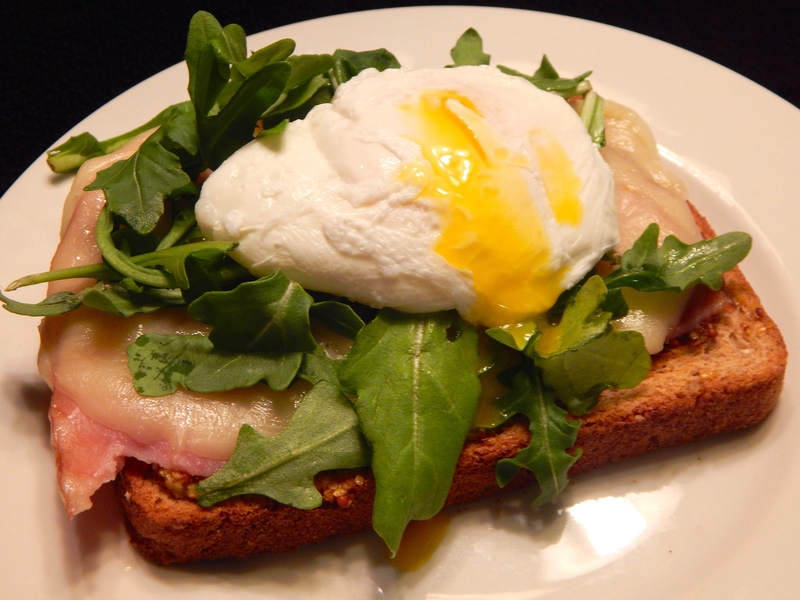 Open-faced ham, provolone, arugula and poached egg breakfast sandwich. Perhaps I don’t need to worry too much about finding that magazine. If you live in El Paso or have lived in El Paso, you know the Franklin Canal carries irrigation water from the Rio Grande to thousands of acres of farmland in the lower valley. The drought of the last several years has greatly reduced the volume of water available from the river. I would not think of cooking anything that swam in the canal, so when the urge strikes, I head to the seafood counter or freezer section of my neighborhood supermarket. Sometime ago, my blogging friend, Darryl, described feasting on cioppino in San Francisco’s oldest restaurant, the Old Clam House. 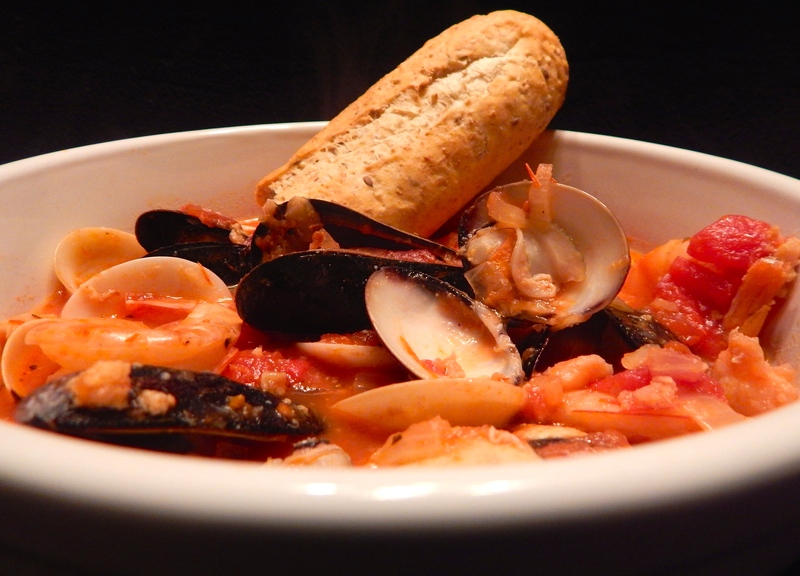 He kindly shared a family recipe for this Portuguese/Italian seafood stew. I’d been craving it for days since reading his post. Cioppino on a cool fall evening near the Franklin Canal. No recipe in hand, here’s what I did: I sweated about 1/2 medium chopped onion in butter and as it was done, bloomed two cloves of minced garlic. Next, I added a can of Italian herbed (garlic, basil and oregano) tomatoes and a can of tomato paste., a cup of water, a cup for chicken broth and about a cup and 1/2 chardonay. I added a teaspoon of dried thyme because I like the flavor. This all simmered for about 30 minutes to marry the flavors. Test tasting along the way made sure all was balanced. When I was happy with the broth, I tired in small cans of minced clams and chopped crab. I added a half point of mussels, a dozen and a half raw shrimp, a bag of baby clams from the grocer’s freezer section and a few chunks of cod. The shellfish opened, the shrimp turned pink and curled their tails as the broth came back up to temperature. I dished it up and added a hot section of multigrain baguette for soaking up the broth and it was dinner! It wasn’t quite the ambiance of dinning in San Francisco, but for desert boy’s homemade cioppino near the Franklin Canal, it was pretty darned good. It made me remember my first taste of cioppino on Fisherman’s Wharf in San Franscisco. I went to the store intending to get salmon, but I found a pair of beautiful inch-thick pork chops that I couldn’t pass up. The chops looked like small roasts and set my mind spinning about how to set off their flavor. I pan broiled the chops with just salt, pepper and a hint of garlic powder. I set the chops aside and caramelized a sweet/tart and crispy Pink Lady apple and strings of onion in the pan drippings. 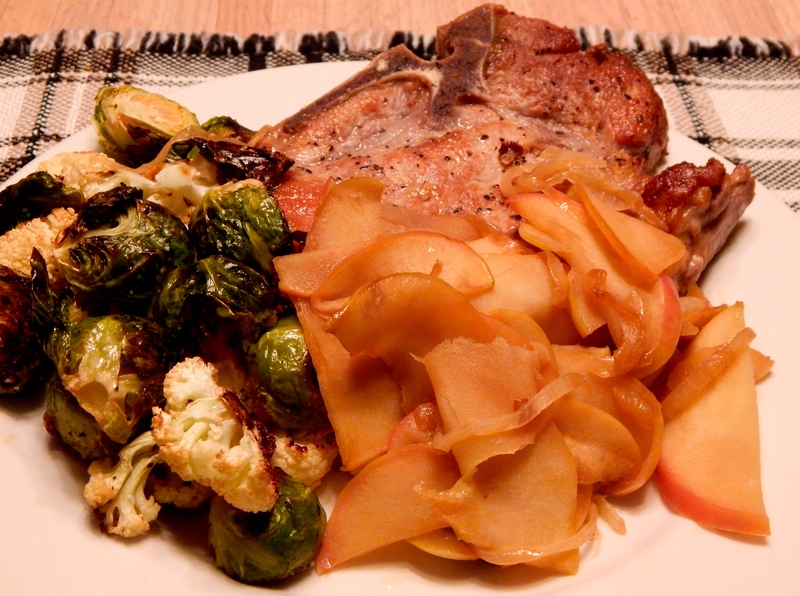 The apple and onion were the perfect enhancement for the rich pork flavor. On the side, I roasted halved Brussels sprouts and cauliflower florets tossed with olive oil, salt and pepper for a savory side. I roast the vegetables at 400 degrees for 10 minutes, toss them around and put them back in the oven for a final 10 minutes. The loose sprout leaves get a nice char which accents the whole dish. That thick chop was just shy of a pound. I couldn’t finish it in one setting, so there will be a pork and dijon mustard sandwich coming in the near future! Two Almost Too Good To Share! Sometimes you have to start with a Tex-Mex treat and then add something with a southwest kick. The result is one great meal! On the left, Steak Tampiqueña – house favorite grilled beef loin topped with sautéed onion, tomato and long green chiles. On the right, a new favorite, roasted sweet potato and black bean salad with onion, red bell pepper and cilantro in a jalapeño vinaigrette. the pair compliment each other perfectly. Sometimes we have breakfast at the doublewide. Sunday morning. Felt like a waffle day. 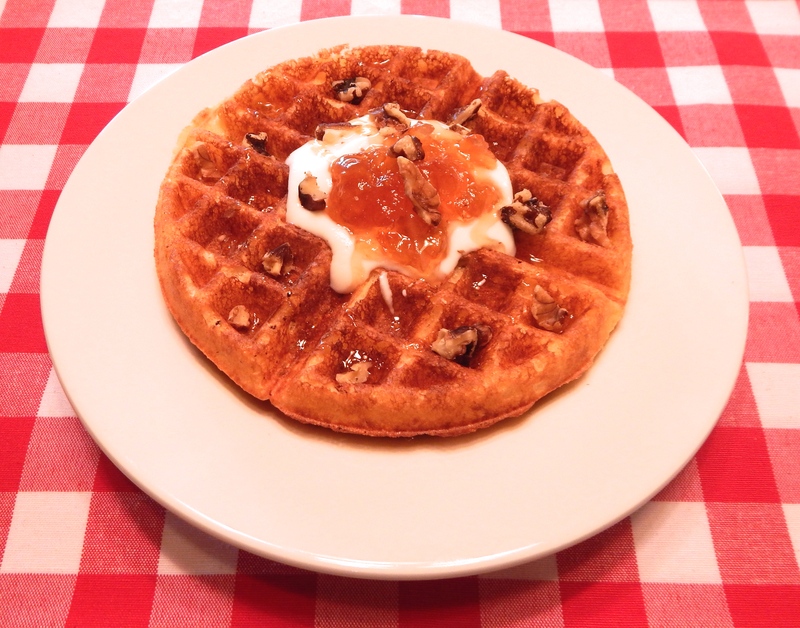 Not just any waffle, though; I wanted savory and a hint of sweet, so I made cornmeal waffles. I cut my regular recipe in half and got 2.75 crispy waffles from my Belgian Waffle maker. Just right for two servings with a little treat left over for the dishwasher who happened to be me. 3/4 Cup all purpose unbleached flour. 3/4 Cup + 2 TBSP milk. I used a combo of buttermilk and 2% milk because I ran out of buttermilk just shy of enough for the recipe. Beat egg until fluffy, add milk and butter and mix together well. Be sure your melted butter is cool enough to no cook the egg and that your milk is warm enough to not harden the melted butter. It’s a balancing act sometimes! Stir dry ingredients together until well mixed. Slowly add dry ingredients to liquid and blend into a smooth batter. Pour and appropriate amount of batter into your waffle iron and cook according to iron’s instructions. My rule of thumb is: When you don’t see steam coming from the waffle iron, the waffle is done. Peek and remove the waffle if it is cooked to your liking. I put my cooked waffles on a cooling rack rather than stacking them. They stay crisp that way. 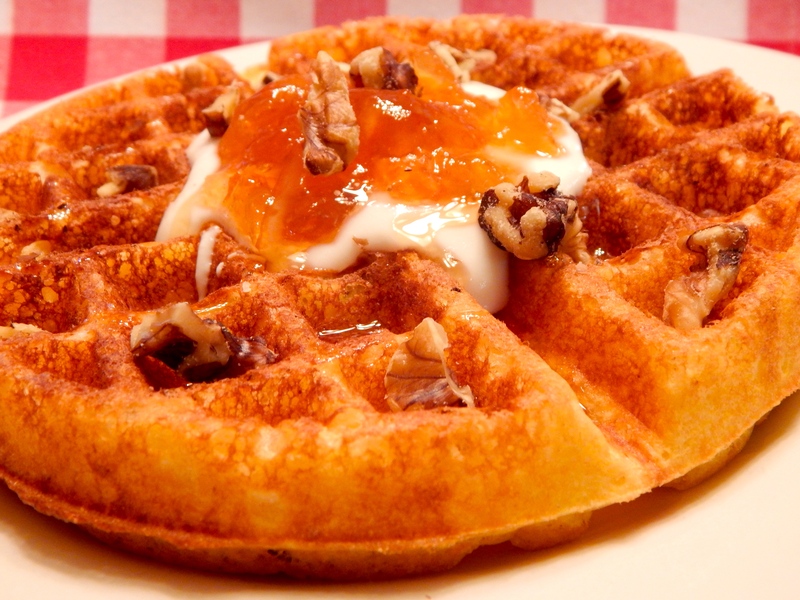 I topped my waffle with a healthy dollop of Greek yogurt, a dab of three fruit marmalade (grapefruit, orange and lemon), a drizzle of honey and a few walnut pieces. The post-Thanksgiving leftover marathon has ended. The holiday dinner was wonderful and the leftover creations were good, too. They included the usual sandwiches of turkey and stuffing, reheated sweet potatoes that were roasted with spreadable apricot preserves and fresh ginger; and the ever essential green chile and turkey enchiladas streamlined with a cream of chicken soup base all had their turn. We did a soy-chorizo, apple and pecan cornbread dressing that was a big hit. I rewarmed a bit and topped it with a soft cooked egg one morning as a very special breakfast. There’s still one piece of apple pie that is looking very sad. Now it’s time to try some new things to freshen the palate and be kind to the waistline before the December festivities get rolling. I felt brave at the store last night and picked up two salmon steaks. I usually get filets, but the steaks were too tempting this time. I didn’t know that the tiny circle of spine was host to a few hundred (or so it seemed when I removed them) pin bones. Thank goodness for a pair of needle nose pliers in the kitchen drawer for such operations. The recipe I tried used a sprinkle of salt and pepper and a basting of olive oil, minced lemon zest and chopped fresh thyme. It called for roasting the steaks at 275 degrees for about 18 minutes. The low temperature rationale was to allow the fat in the salmon to melt into the tissues and produce a softer textured steak. The result was delicious, but the flesh was pale and the texture was unfamiliar and a little disconcerting. The oil, lemon and thyme baste was a great compliment to the fish. We enjoyed the salmon very much, but next time I’m going to up the temperature after about 10 minutes and firm up the meat to a texture that is more familiar. Live and learn. The salad was also a new recipe. Collard greens, stems removed, leaves chopped and tossed with thin sliced radishes for a little zip. Lightly fried shallot rings garnish the salad. The oil in which the shallot was fried (3 or four tablespoons) was blended with two tablespoons white wine vinegar and a little salt and pepper with which to dress the salad. The shallot oil dressing was so good that I’ll be trying it on other greens. Of course, I’ll make good use of the fried shallot rings.